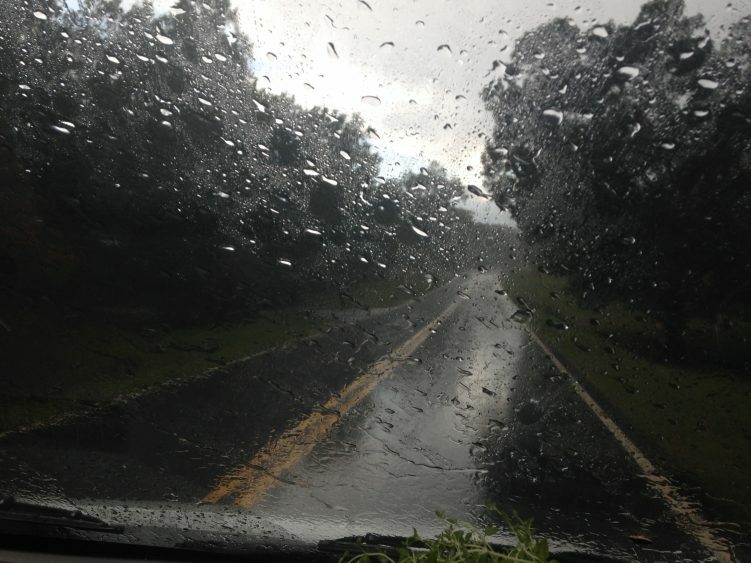 When you’re living in a cargo van, you are susceptible to encountering bad weather conditions as you travel the highway, particularly rain. We had to face that eventuality many times in our 2½ years of traveling the country. And we’ve kind of learned what we can do when rain tries to keep us pinned down. It wasn’t long ago when we heard the raindrops hitting the roof of our van as we tried to drift off to sleep. When we awoke the next morning it was still raining so we consulted our iphone weather app to see how long the rain was going to last. We discovered that it was supposed to rain the entire day and also the next day as well. Since we try to eat our meals in local parks, rain can be a deterrent to doing that if we can’t find a park with a picnic table shelter. So, oft times we’ll simply drive to a nearby McDonalds and order our breakfast off the dollar menu, along with our senior coffee, of course. The cost of doing that is pretty reasonable for the two of us and will often be simply $4-6 to begin our day (yes, it’s a little cheaper to fix breakfast in a park - but that amount isn’t too bad). After breakfast, we’ll seek out the local library that will become our extended living room for working on email, finances, blog articles, and just general relaxation. We’ve enjoyed some very nice local libraries in towns where you wouldn’t expect much of a library at all. And, if it’s still raining in the evening and the library has closed, we might head over to Lowes and enjoy watching a movie in the parking lot prior to heading over to our designated camping area. So, that’s one way to handle a rainy day. Another way is to drive through the rain to some better weather. That’s where we get our our maps and check our iphone’s weather radar to determine whether there’s a place that is on our approximate course, where we can escape the inclement weather for a sunshiny sky. But, sometimes it’s not possible to drive through a storm. We do have an approximate course in which we head, but we may not see a good option for driving through the storm. On one occasion recently in Wisconsin, we encountered a rain storm where we decided that it would be best for us to exit the road and find a place of shelter. We happened on a Wal-Mart where we pulled close to one side of the building and watched the sky grow very dark with the storm. We heard the alert on the radio, that we just happened to have on at that time, that there was large hail that was coming with the storm coming across our path and we didn’t want to drive through that kind of weather. So, Walmart’s building protected us from the winds as well as the driving rain, and the hail was small enough that it didn’t damage the van, plus, we had a front row seat while the storm passed us by. It was actually quite exciting! On our first year of travels we planned our trips in such a way that we avoided the rainy seasons that come around the country. And when the South was having a lot of rain, we were enjoying our time in the desert areas of the country: high and dry! Another way we handle the rain is determined by whether we are near some of our relatives or friends. If we are, we’ll just head over and visit with them for a day or so. Since we sleep in our van, all we need is a level place to park and we don’t put anyone out of their bed, and we enjoy catching up with family news and such (of course we would call them prior to our “just dropping by”). Sometimes you just don’t know what the weather will bring. But we simply try to make the best of each day and enjoy being with one another. When we first started out on our van trek we were told that it wouldn’t be long before we couldn’t stand one another and we’d quit the trek life. But, since February of 2013 we have yet to grow tired of being together 24/7. Bonnie says she’s been waiting for this time all of our married life (which will be 50 years next August). We both have had a great time of growing closer as the days have passed. So, don’t let the threat of rain keep you from doing your own trek. There’s always something you can do when it rains!